We require a 2 hour minimum rental fee of $50 and our cost is $25 per hour. If you go over the two hour time frame you will be charged $25 per hour. Rental time ends at Noon. If you would like to reserve all day please call the store at 210-698-6076. Valet service: $25 and includes sewing on your 3 zippers and loading the quilt top, bottom, and batting before you arrive for rentals. 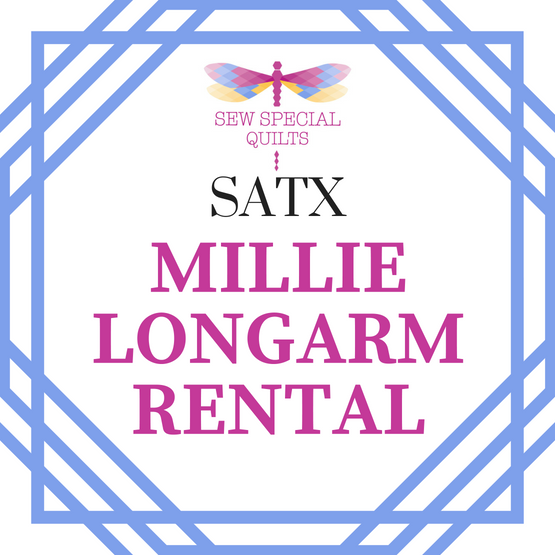 You will need to drop off the backing, batting, and quilt top a minimum of 2 working days prior to scheduled rental. If you need to cancel please notify us by calling the store. IF you cancel more than 48 hours in advance you can receive a full refund or store credit. If you cancel 48 hours or less you will receive a store credit.